Would you like to make make money with surveys while working from home? You can get paid to give your opinions on products, make recommendations, or write reviews—sounds pretty easy and awesome, right? 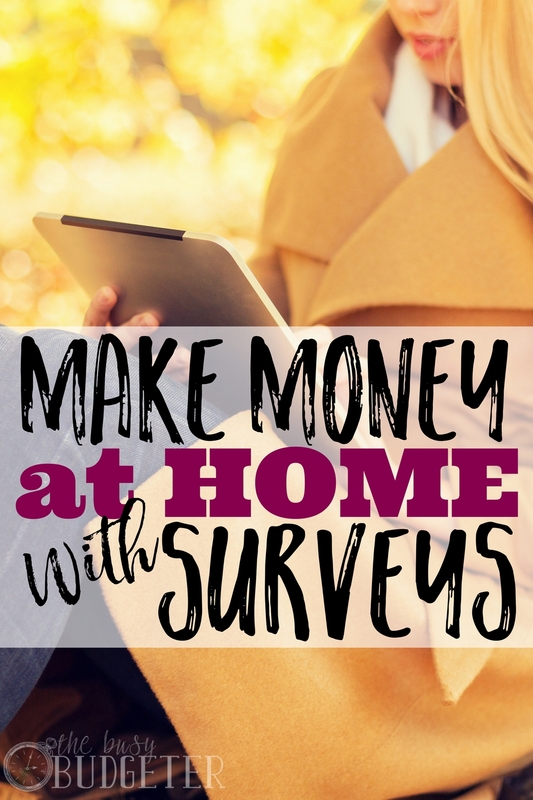 I’ve had readers come to me many times about online survey companies and ways to make money with surveys, but still work from home. Some people have great success with it. Others have questions on the logistics, like, is this legitimate work? Can it be done? How do you do it? What are the best companies to work with? Okay, so in the interest of full disclosure, I have to be honest. I don’t LOVE surveys. In fact, I used to be pretty solidly anti-survey. I just find them to be time consuming and complicated, and the payout isn’t that great. Yes, they’re easy, and yes, you can earn some money. 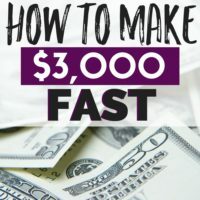 It sounds like a pretty simple way to earn that’s very low-risk, but you can also spend a lot of time filling out surveys and jumping through hoops just to discover you don’t qualify or that the payout is peanuts. I would rather see you use your time and energy doing something you love doing. 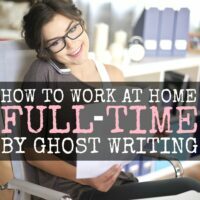 I know blogging isn’t for everyone, but it’s so fun and easy—and you can earn great money doing it. (No kidding!) If blogging isn’t your thing, there are plenty of other non-blogger ways to earn money from home, too—like user testing, freelancing, or becoming a virtual assistant. It all makes survey taking seem a little pointless, right? But then I thought about it a little more. First of all, surveys are great if you’re looking to earn some quick money for things like family vacations, holidays or gifts. They’re low-risk with a quick reward, and that can be really comfortable. Programs offer payouts in gift cards and credits that can build up pretty quickly, especially if you’re using preferred retailers from their list like Amazon. For shopping, companies like Swagbucks offer amazing returns and discounts—saving you up to 25% on your purchases! So if you’re going to shop anyway, using a survey company such as Swagbucks is a no brainer! Plus, how many of us spend our spare time mindlessly scrolling through Facebook or looking at YouTube videos anyway? If you can earn money while you’re clicking and watching or playing simple (and entertaining) games, why not do it? Some of us don’t have a bunch of time to write, blog, or deal with an online job, but you can pick up a gift card or two while answering some questions—easy. So I’ve revamped my position a little. There are definitely some merits to doing online surveys and working with survey companies. You just have to be smart about the way you do it, and make sure you’re not getting bogged down by a timewaster. 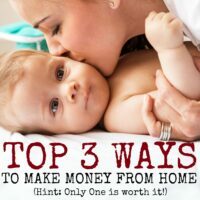 So what are the best ways to work from home and make money with surveys? Swagbucks is a platform where you can earn “Swagbucks” or credits that are worth about $.01 each. Sounds like nothing, I know…but they do add up pretty fast. (For example, you might earn between 75 and 300 Swagbucks for completing a survey. The “’bucks” can be traded in for gift cards and credits with online retailers (like Amazon, Starbucks, Wal-Mart and more). Swagbucks offers ways to earn by watching videos, giving reviews, playing games, and by simply using their search bar, which is really easy to install. THEN I found out about the ways you can earn Swagbucks by simply “clicking through” their site to retailers you already planned to visit (like travel sites, ThreadUp and Amazon). I gave it another chance and was totally convinced! The returns are really great and the setup is easy. Even if you do nothing else on their site, this alone makes signing up for Swagbucks worth it. It’s basically free money—in a format that works well for a lot of people. I don’t use Swagbucks as a way to earn monthly income or anything like that. It’s just not practical (nor would that be realistic). But by using the search bar and clicking through their site when I shop online, I’ve earned up to $250 in Amazon gift cards and credits. It’s a pretty awesome return for a pretty low effort. So if you’re looking for something simple, give this a try. Even if you aren’t into the survey aspect of Swagbucks, if you shop online and do a lot of searching, it will earn you some extra money, and the discounts from retailers are pretty good! Looking for other ways to make money with surveys from home? There are plenty of other survey sites out there. Harris Poll (like the famous Nielson ratings on TV programs), Inbox Dollars, Global Test Market, and several others are all available if you’re interested in pursuing surveys as an earning option. These companies all offer an opportunity to take surveys online in exchange for points, retail credits or discounts. From my research, Swagbucks has the easiest payout for the most minimal effort, but several other survey companies can offer some nice rewards, too. With Inbox Dollars, you can earn money for playing games, filling out surveys, and shopping at targeted retailers. It’s similar to Swagbucks, but without the search bar. Global Test Market has an A+ rating on the Better Business Bureau, and also pays in credits and retail discounts. They’re a more serious retail survey company and they do a lot of consumer research for big national companies. Harris Poll has been around for a long time and also offers a sweepstakes you can enter by simply filling out the qualifying questions for surveys (even if you don’t qualify). If you do qualify to take part in a survey, you earn points you can trade in at many different retailers. So surveys are one of those things that you should do if you really enjoy them, find it easy, or don’t mind clicking while your kids are napping or you’re zoning out in front of the TV. If you just want to make your Internet surfing (does anyone say “surfing” anymore?) worthwhile, then surveys can be easy and definitely interesting. Swagbucks is probably your best bet, even if it’s just for the search bar and the shopping rewards. It’s simple to do and you get a payout without too much effort. As for supplementing your job or earning money from home doing surveys, I don’t think it’s as worthwhile as pursuing something you really love to do. If you have the energy and time to do online projects, user testing or starting a blog would be a better way to earn more money. Surveys can be a fun way to get your voice heard and earn a little extra on the side. 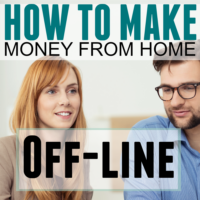 If you’re looking for ways to make money with surveys and want to work from home, pursue some of the options above and you might be surprised at the rewards! I’d love to hear what you discover and what survey companies you enjoy working with. Let me know! I need to get back on track with my Swagbucks! I’ve earned a few gift cards with them before, but just fell out of the habit of getting on there daily. Taking surveys has always been a bit of a pain since almost every single time I’m disqualified after wasting at least 5 minutes of my time. I wish there was an easier way with those! My experience with surveys is actually also not very positive. I do not get qualified each time I tried, probably because I’m staying outside USA. But I saw in YouTube many people are able to earn some cash this way so I believe it may work. Love this post! Wonderful work – we agree with the idea of the side hustle and surveys at home are a great way to do that. Great blog! I’m usually a skeptic about stuff like this, but just wanted to share another legit paid survey site OpinionWorld.com.au. Yes, this is legit and pays cash to PayPal against the reward points when you do surveys for money. I need to get back on track with my cashmoneyforsurveys! I’ve earned a few gift cards with them before, but just fell out of the habit of getting on there daily. Taking surveys has always been a bit of trouble since almost every single time I’m disqualified after wasting at least 5 minutes of my time. I wish there was an easier way with those!